“We choose to go to the moon, not because it is easy, but because it is hard!” John F. Kennedy, Sept. 12, 1962. Rice University, Texas. Huh! What did he say? President Kennedy’s speech, kicking off the Space Race, was inspired words. But everyone knows the real reason we went to the moon. We went because it was COOL! 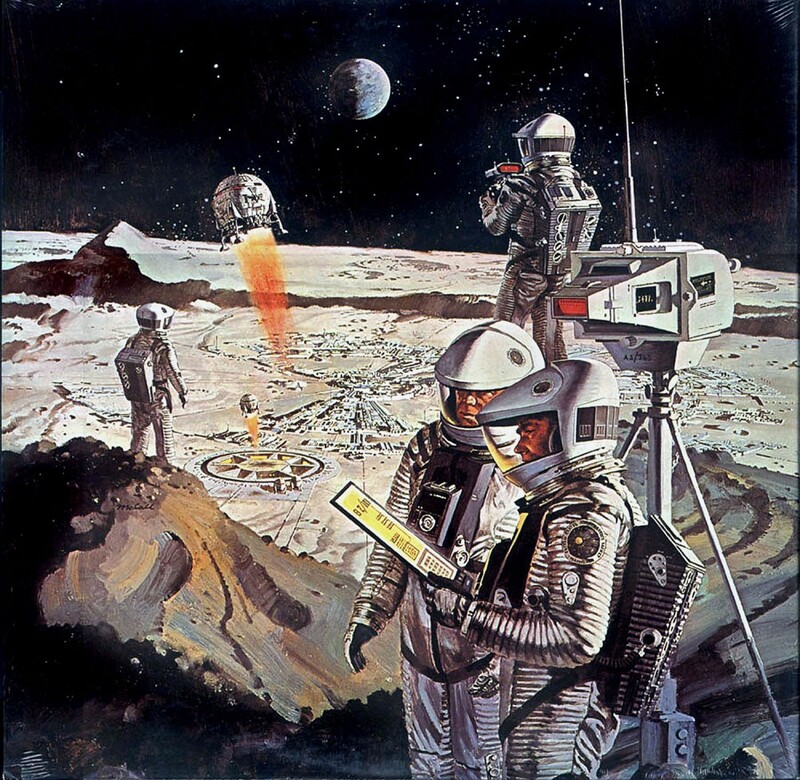 What showed us how cool it really was going to be was the artwork of Robert McCall. In the Space Age of the 1960’s, at a time when fuzzy black and white TV had only three channels, magazines like LIFE and LOOK were universal cultural arenas. Everyone, and I mean the entire population, saw the contents of these weekly publications. With a solid background in commercial illustration Robert McCall began to work for LIFE, and later directly for NASA, letting us see and feel what voyaging into ‘the final frontier’ would really be like. Robert McCall’s paintings of astronauts and space-craft of the present and future were at the same time both emotional and technically accurate. With vivid color and style he portrayed a highly scientific endeavor as a grand heroic adventure. McCall’s artwork made it all real and believable. It fit our imaginations. It captured and lifted high into the starry sky our proud hopes and dreams. It was the artist inspired with paint and canvas. An ancient phenomenon that has recorded most of oue history. Sadly, today’s cheap and childish computer illustrations are not even a remote imitation. Present day ‘creative’ expressions of space exploration have all the fun and zeal of a bureaucratic budget conference. ‘CAD’ renderings of children’s blocks and Tele-Tubby astronauts. Robert McCall was born in 1919 and lived to be 90. He lived and felt our rise from Kitty Hawk to the Sea of Tranquility. As a commissioned artist he witnessed 25 rocket launches; felt the thunder in his bones. It is my rough estimate that for every dollar spent for Robert McCall’s artwork, NASA gained at least a million back in appropriations and public support. It is because he was an artist… it’s because he made it look COOL!